With recordings for Rescue Records and Tooth and Nail Records under their belt, BLAH is ready for the kind of launch that their music deserves with their sophomore release, and Bulletboy Music debut. BLAH's music combines the modern punk style with '50's surf music and rockabilly to create a unique and exciting genre all their own in the Christian market. 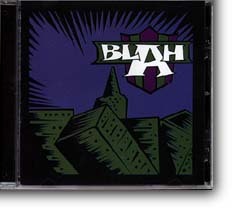 BLAH has been together since 1995, with members Alex Rosas (singer) and Jeremy Carlson (guitarist) having worked together since 1989 in the band Childhood. Jeremy joined BLAH after the release of the band's first CD, "Born Lost and Hopeless," on Rescue Records. The band went on to entertain a deal with Tooth and Nail records, appearing on the label's sampler, "I'm Your Biggest Fan." Eventually dismissing the offer, BLAH continued to play mid-western and western dates throughout the mid and late nineties, with notable appearances at the annual Cornerstone festival in Illinois. Now signed to Bulletboy Music, BLAH (Rosas, Carlson, James Jenkins (bassist), and Jameson Becker (drummer)) regularly headlines shows and shares the stage with Johnny Respect, Five Iron Frenzy, and Ghoti Hook. BLAH plays their new material exclusively in concert, usually to the tune of twenty intense surf, rockabilly and punk songs per outing. BLAH's mission is to preach the gospel of Jesus Christ through quality and original music. And with their evangelistic lyrics and dirt-honest dialogue from the stage, BLAH continues to reach out to their peers and to the teens of today looking for substance in their pop culture.